One day Nat and I were heading towards our milkweed patch to look for caterpillars. Nat started looking under the milkweed leaves, quickly looking for caterpillars. Then I came along and started helping Nat look for caterpillars. Finally, after a few minutes, we found a monarch caterpillar! Once we found the caterpillar, Nat started picking leaves. This is a picture of Nat holding the milkweed leaves. Now it is time to feed our caterpillar. When we got back, I gave our caterpillar some water. Then I put the leaves in the water. That made our caterpillar happy. Then I put on the lid so the caterpillar would not escape. Finally, our caterpillar evolved into a chrysalis! And then, Nat put the chrysalis into our butterfly cage. 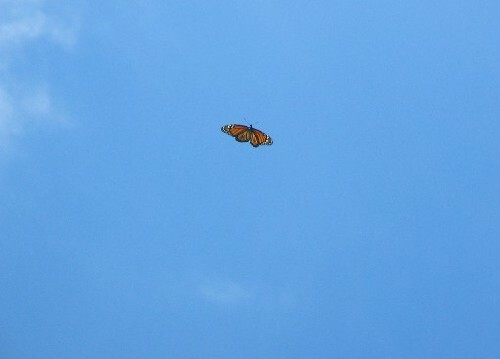 When we could see the butterfly, we were really exited! So we moved the butterfly into a cardboard box to make it easier to take pictures of. When suddenly... the butterfly came out of his chrysalis!!!!!!!! When the butterfly was finally out of its chrysalis, it was ready to get set free! First, the new butterfly checked out Nat. And then the butterfly was brought outside! And with a sudden movement, the butterfly flew onto the roof!